The First Cut - When is it Time for the First Spring Mow? It catches me by surprise every year - I go to bed with a dormant winter lawn, and when I wake up, the grass has grown three inches and is suddenly vibrantly green. There are tiny leaves on the trees that weren't there yesterday and blossoms on my cherry tree when I hardly even noticed buds. And it gets me itching for the smell of freshly mowed lawn! But with the erratic weather we've had this Spring, it's hard to know when it's time to haul out the mower and get to work. So when, exactly, is the right time to give your lawn its first Spring mow? Here are some tips! If you are noticing new green grass growth in your lawn, it means the ground has warmed up sufficiently, and mowing no longer poses a threat to dormant turf grass crowns and fragile root systems. Often, it's hard to know whether your yard is too wet to mow, so go out and take a walk around. If you are sinking into the ground, it is too wet. If your shoes get wet, but you aren't getting bogged down, the conditions aren't ideal, but you can proceed with a few suggestions. Sometimes, especially here in Ohio, cutting a wet lawn is a necessary evil. I've compliled some of the best tips from Life and Lawns, American Lawn, and the Landscaping Guide from SF Gate and put them together in one place. Below, you'll find easy ways to minimize the risk of damaging your Spring lawn by mowing wet grass. 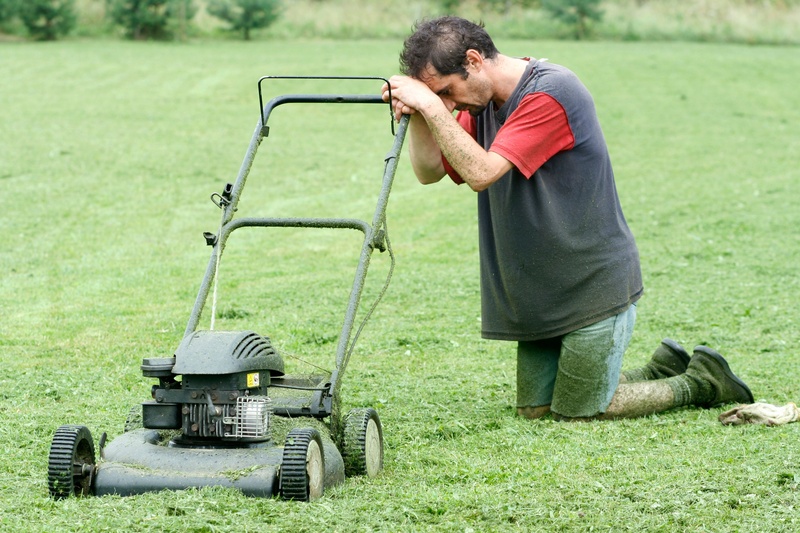 Keep your mower blades sharp - wet grass is slippery and harder to cut. Having sharp blades will will give you a cleaner cut and may catch wet grass that would otherwise "duck" under a dull blade. Push your mower slowly, so the mower blades have time to catch wet grass. Don't try to bag it, and turn off the mulching setting, which will make the grass clump more. Cut on the highest blade setting - this will help prevent clumping, which can collect on areas of your lawn and kill it. Mow the perimeter of your lawn first, so that you blow grass clippings away from the center of your yard. Overlap your rows so that you are only cutting "half rows". This will take longer, but produce less frustration as you'll gunk up your mower less frequently. 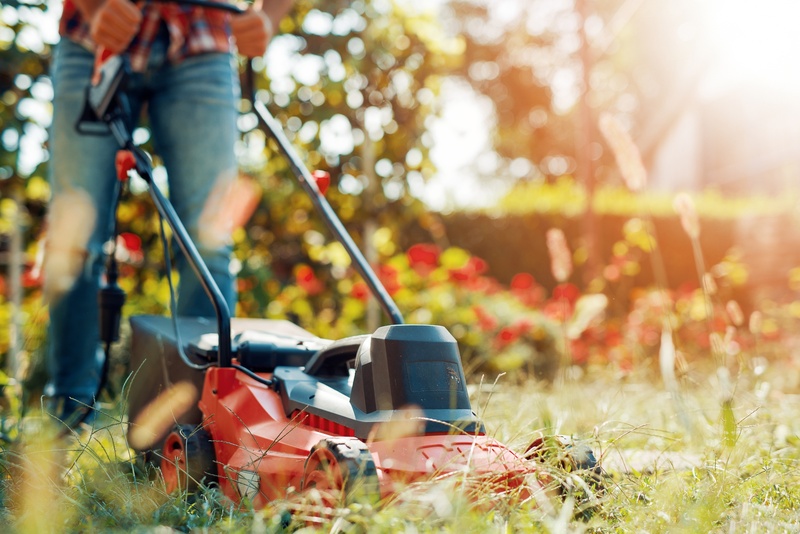 Occasionally turn your mower off, wait until the mower blades have completely stopped spinning, and wearing gloves, remove grass clippings that have accumulated under the mowing deck. When you're done, you may rake your lawn, paying particular attention to the clumps of wet clippings littered across your lawn. If you have any questions about Spring lawn care, or if you are ready to turn your lawn over to the professionals, contact us at any time for a free quote. Click below for our FREE MONTHLY GUIDE, and see what you can do NOW to make your lawn look great in the coming months!